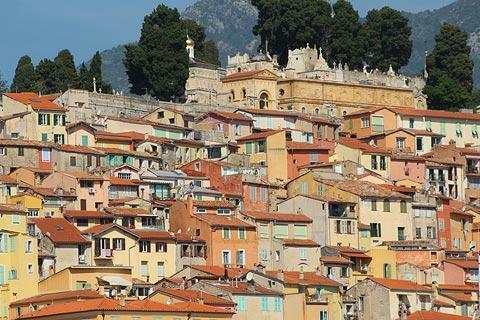 Menton is a coastal town and resort on the Cote d'Azur close to the French border with Italy. The town was founded in the 13th century by the Genoese. 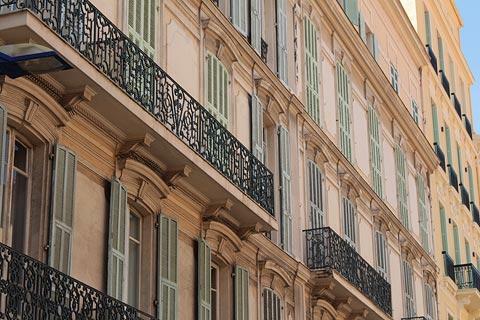 Ownership passed to Monaco in 1346 and remained with them for 500 years. 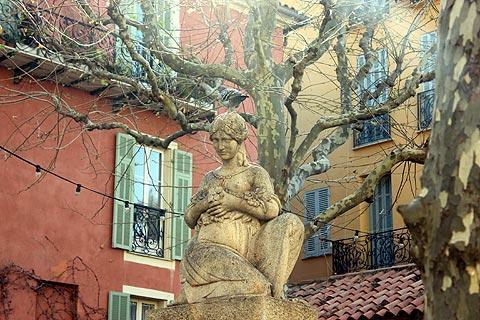 In 1860 control of Menton passed to France. 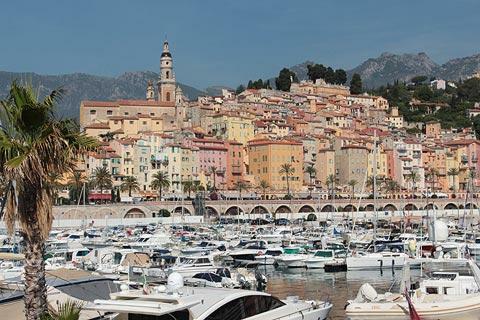 This coincided with the start of tourism in France and Menton has been a popular destination ever since. 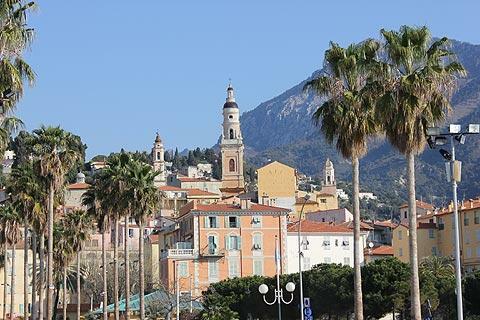 Due to the mountains behind the town that protect it from the cold northerly weather Menton has a fine climate even compared with the rest of the French riviera, and this explains the many attractive gardens that you will see as you explore and for which the town is well known - and also make Menton popular with visitors in the winter as well as the summer. 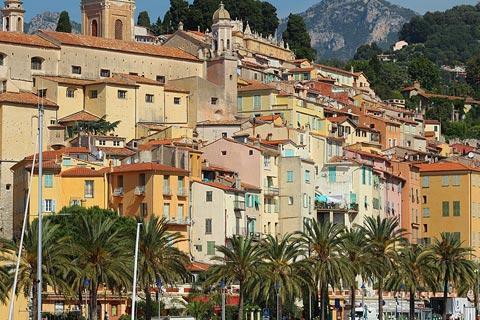 France This Way comment: the combination of the sea and port, the extensive old town, and the magnificent gardens and villas make Menton one of the most popular and vibrant destinations on the riviera - and one of our favourite French resorts. 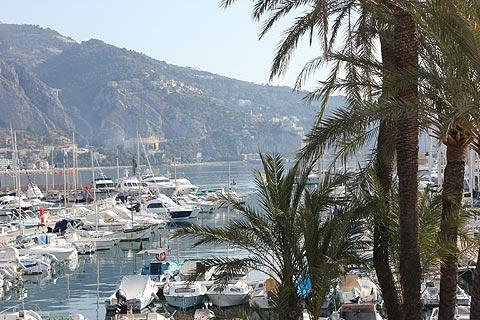 Most visits to Menton will start on the coast, which has a beach, a pleasure port and a traditional harbour to enjoy. 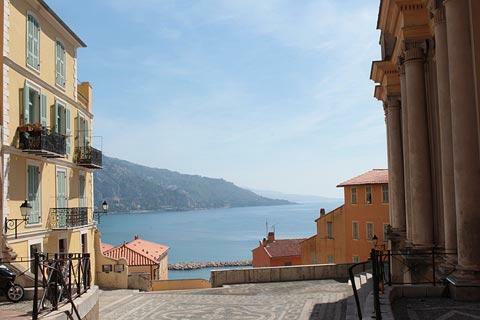 It is also a perfect place for a promenade, with views out to sea and along the coast in both directions, and a picturesque view of the tall pastel painted houses of the town and the mountains behind. There is a small fort on the edge of the harbour. Next to the fort you can walk out along the harbour wall to have the best view of the town, with mountains and the church behind the tall colourful houses that surround the harbour. 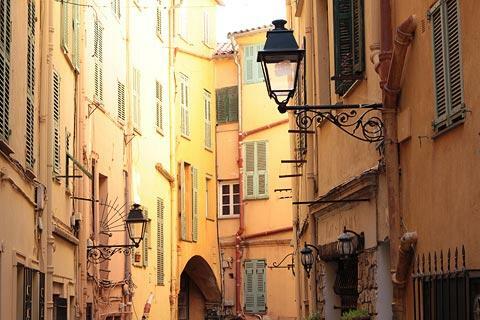 Behind the seafront in Menton you can explore the narrow streets of the old town, in particular the lively and colourful area around the main pedestrianised street, Rue Saint-Michel. 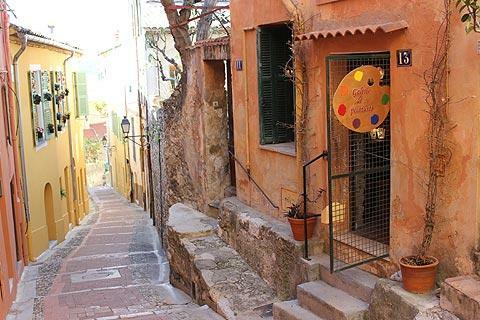 From the cafe-lined Place aux Herbes you can follow the steep streets with traditional Provencal townhouses lined with shops and restaurants. The roads become quieter but are still very picturesque as you climb towards the cathedral and cemetery. 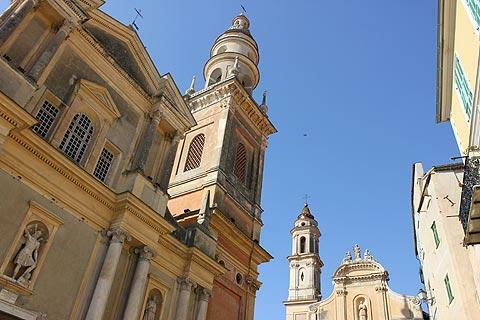 Along the way you reach the principal historic monuments in Menton: the Basilica Saint-Michel and the Chapel of the White Penitents. 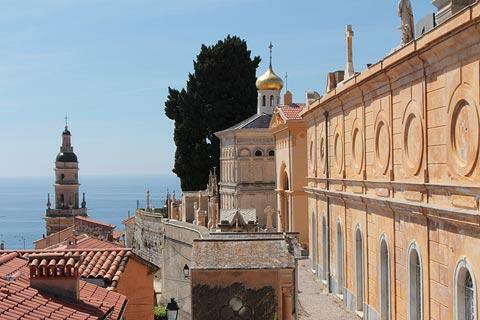 These two religious monuments both front onto a small square with views out across the harbour, and this baroque ensemble creates one of the highlights of your Menton visit. The 17th century baroque style Basilica of Saint-Michel was built (starting in 1619) to replace a more modest church that previously stood in the same location. The ornate and elegant baroque facade was added in 1819. The interior of the basilica is also very impressive and in the baroque style. 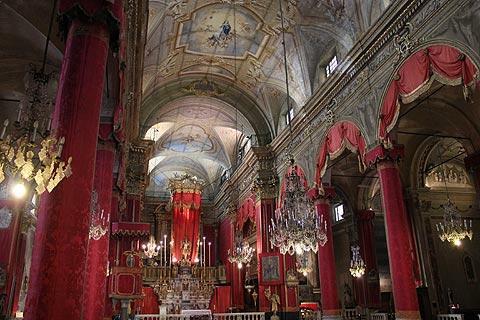 If you are lucky the interior will be heavily draped with crimson curtains and cloths around the columns when you visit: these hangings are made of damask and a gift to the church from Honoré III when he married a Genoese princess in 1675, but are not always on display. The church is unusual in having two steeples, with the older clocktower to the left dating in part from the 15th century while the taller ornate belltower that dominates the skyline of the old town was added in 1701-1703. The statues inset in the facade represent Saints Michael, Maurice and Roch. Inside there are three naves, with six chapels to either side which, along with the choir, contain numerous works of art. It was only in 1999 that the church was designated as a basilica. Next to the church, the Chapel of the Immaculate Conception (also known as the Chapel of the Penitents Blancs) is also noteworthy. Built in 1687 it was used by the penitents blancs until the revolution. A significant rebuild was required after earthquake damage in 1887, with the new frescoes in the vault by local artists. It is always hard to imagine how these small towns paid for such grand monuments. In the case of Menton a special (and onerous) tax was charged on local farmers and wine producers for a period of 20 years to raise the money required. It is not recorded whether they were happy to make this contribution to the town's heritage! Continue to climb the narrow streets and staircases behind the chapel to reach the cemetery. Originally the Chateau de Menton stood at the top of the hill. The ruins of the castle were converted into the cemetery after 1804 after Napoleon decreed that people could no longer be buried in churches. The cemetery is surely one of the most lovely places in France to be buried! 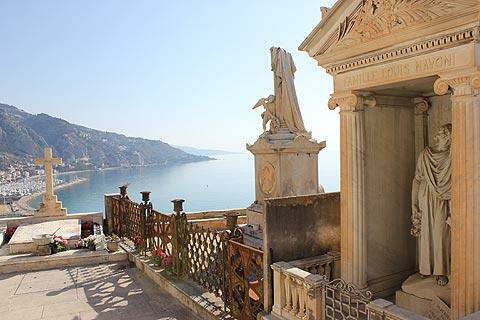 With views across the rooftops and harbour and along the coast to Italy the cemetery contains numerous ornate family burial chapels and graves and is one of the most peaceful and beautiful places in Menton. 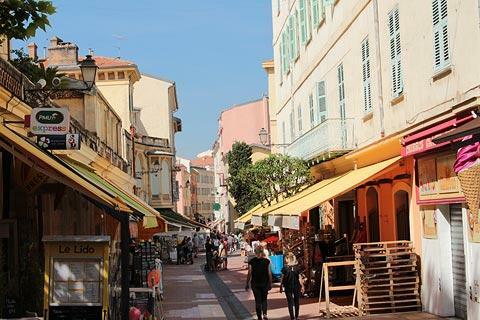 The market in Menton is held each day in the old town in an indoor hall, built in the 19th century. 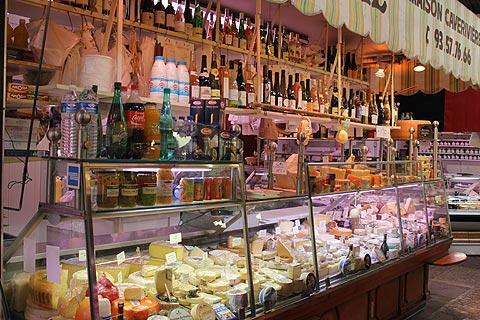 There is a very extensive range of delicious local products such as cheese, meat, fruit and vegetables creating a colourful display and many things to tempt you. Another interesting religious monument is the Russian church, in the traditional russian orthodox style. 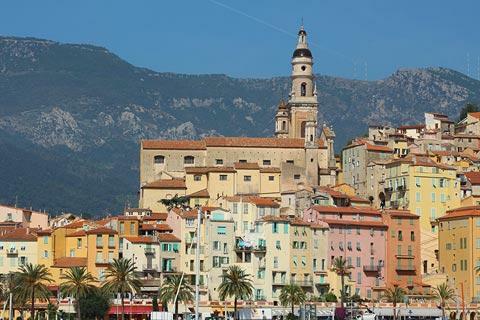 The newer part of Menton (west of the old town and in the direction of the train station) is also pleasant to explore, with many belle epoque villas and newer apartment blocks, various 19th century government buildings and small chapels, various parks and a broad selection of shops and cafes. Further away from the centre, particularly along the Boulevard de Garavan (north of the cemetery) towards Italy there are numerous grand villas surrounded by beautifully maintained gardens, with the turquoise Mediterranean sea as a scenic backdrop. 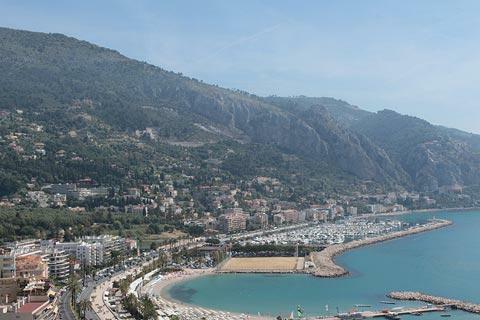 Apart from the Plage du Fossan, the main beach that runs between Menton and Cap-Martin, there are several other beaches along the coast around Menton, including a sandy beach at Plage des Sablettes to the east of the centre (next to the old port). 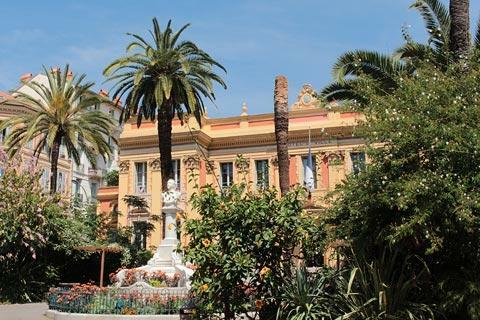 Menton has won several prizes for its parks and gardens and is also a 4* ville fleurie. Many of the streets are lined with orange trees (bearing fruit at the time of our visit) which further adds to the appeal of Menton. 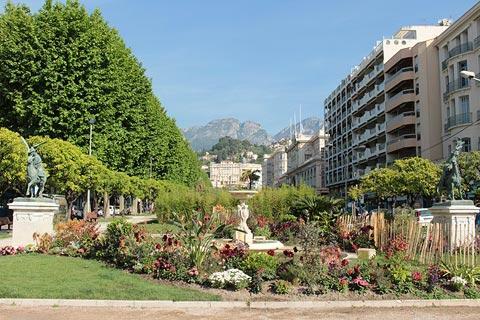 There are several very carefully maintained parks and gardens in the centre such as the Jardins Bioves in front of the Palais de l'Europe (which also contains Menton Tourist Office). The town contains several world-class gardens, such as the Serre de la Madone, the Le Val Rahmeh, the Fontana Rosa, the Maria Serena garden and Les Colombières. The Parc du Pian focusses on olive trees and has some trees that are 1000 years old. This enthusiasm for gardens continues in other parts of the town where several beautifully maintained small parks can be seen. Menton also prides itself on the lemon and orange groves in the surrounding hills and there is a 'lemon festival' in the town at the end of each winter (mid february - early march) which is a major event for the region with music, dancing and street processions including spectacles using an extraordinary number of oranges and lemons! In the Jean Cocteau Museum close to the port you can see a good collection of artworks, mosaics and ceramics by the artist: rather eclectic perhaps but indispensable to fans of Cocteau. Enthusiasts of Jean Cocteau will also want to visit the Wedding Room in the Town Hall, which the artist decorated with frescoes in the 1950s. Other important art museums here include the Museum of Fine Arts, situated in the 18th century Palace des Carnolès and the gallery of contemporary Art is in another impressive building, the Palais de l'Europe. For a change from art the Museum of Prehistory contains numerous artefacts and recreations of life in the region from prehistoric times. 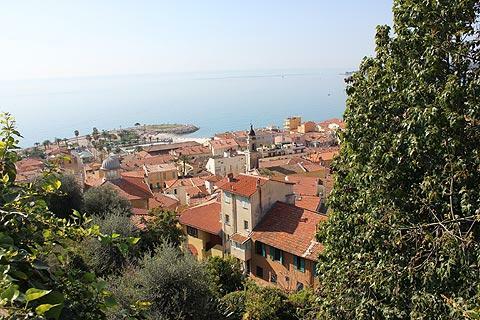 There are numerous local highlights to explore during your visit to Menton, both along the coast and heading inland. 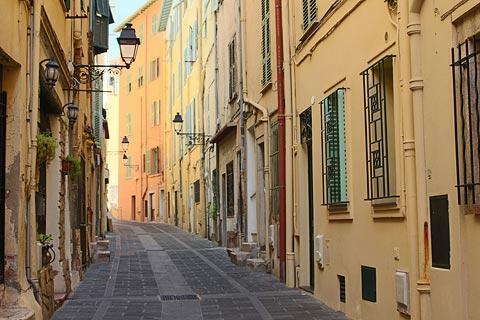 Along the coast our personal favourites include Villefranche-sur-Mer, Monaco and Nice - or a trip along the coastal villages in Italy to the east. A train service runs along the coast stopping at all the important resorts which is very convenient and much easier than driving. 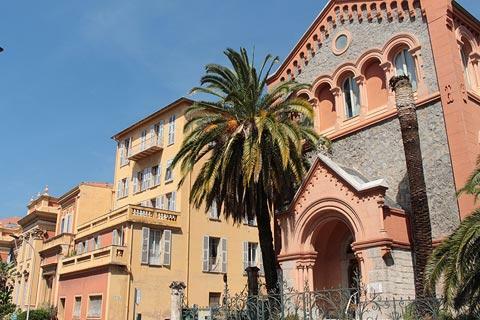 Be sure to also explore inland, with medieval villages such as Eze, Gorbio, Roquebrune and Sainte-Agnes close to hand and the Roya valley towards Tende to the north of Menton.